Last weekend I made these cookies for a special fundraiser bake sale. The fundraiser was for an amazing family who is walking down a very difficult road. Sterling is a precocious and loving little 2-year-old girl who was diagnosed with ETANTR over the summer. 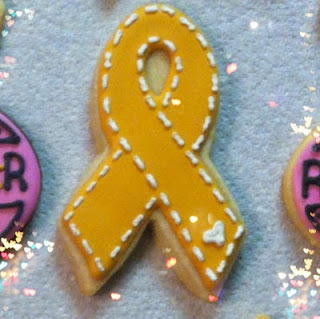 ETANTR is a rare and aggressive cancer that affects young children. Very few have been diagnosed with this type of cancer. This diagnosis broke our hearts with an emphasis on broke. As I watch this family go through everything, I am completely amazed by the way they handle all of it. Their faith only seems to grow and they cling to each other for support. I know many families that have completely fallen apart over much less. They continue to be strong and lean on God's promises for their lives and Sterling's. They lovingly refer to Sterling as a Rockstar and we have all become loyal devotees of "Team Rockstar." 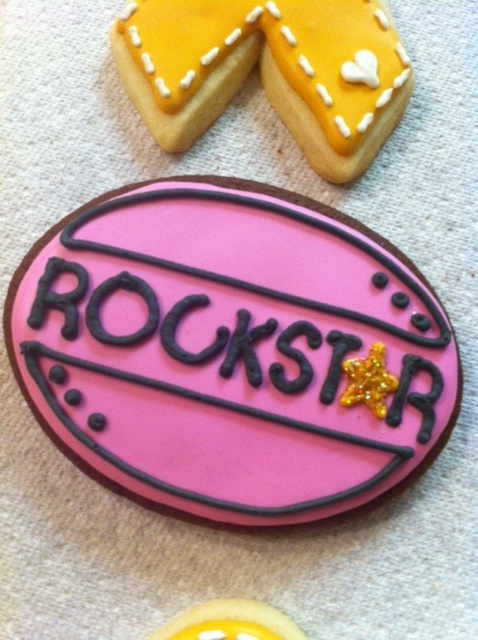 I wanted to make a cookie that copied the Team Rockstar Facebook banner. However, as I got further into the process, I realized the cookies would have been black. 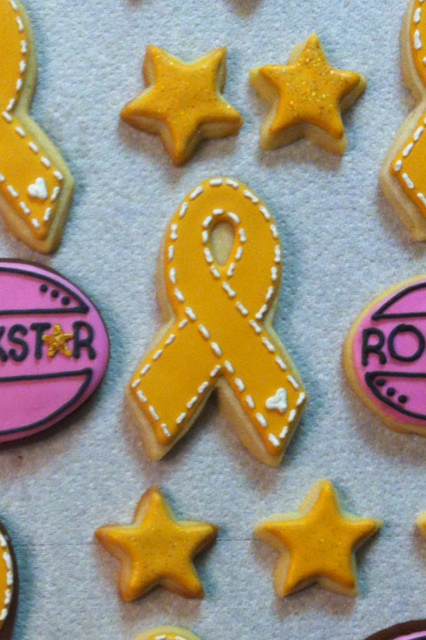 I try to avoid completely black (or red) cookies if possible so I decided on pink (of course!). I also made up some childhood cancer awareness ribbons and stars to go along. 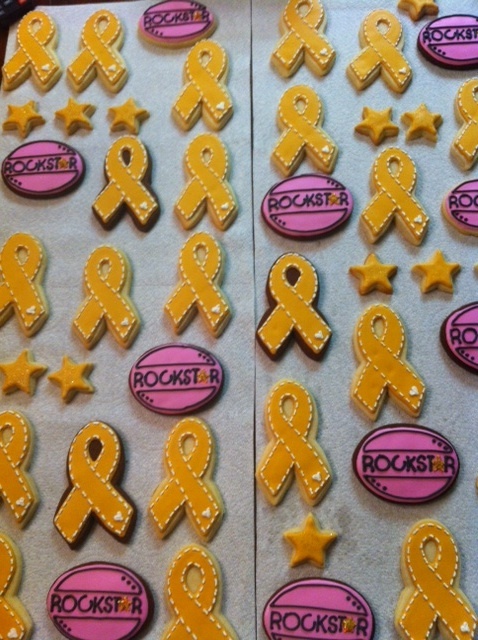 The best part of making up these cookies was using the gold Disco Dust to decorate the stars. Working on this project proved to be difficult to say the least as I worked through tears the whole time. I don't think I have ever prayed over a project like I did over this one. I prayed for her and her family, for peace, comfort, time, but most of all I begged for a miracle. 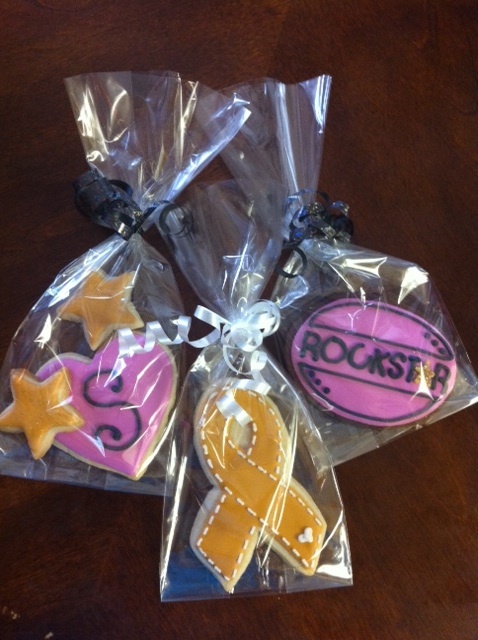 In the end, they are just cookies, but I truly hope they blessed this Rockstar family and brought a little joy to those who bought them. It's one thing for a family to experience such tremendous grief, but to have financial burden as well is too much. Anything helps. Thank you!